My wife is a fan of The Walking Dead and several times per season, she will turn to me and say, "Why don't you like this show?" and my answer is always the same: "Because I've seen it all before." But, such is the case with the zombie genre. Unless the film is an avant-garde piece which is only a zombie movie in theory, the genre doesn't offer a great deal of variety. Sure, we've seen zombie comedies and zombie romances, but they are really just variations on a theme. At first glance, the new film Extinction looks as if it's bringing some new things to the genre, but it's simply cold leftovers. As Extinction opens, we see a group of people on a school bus, who are clearly attempting to flee something. The bus is attacked by very violent people, and Patrick (Matthew Fox), Jack (Jeffrey Donovan), and Emma (Valeria Vereau) manage to escape, along with a baby. The story then leaps ahead nine years. The world has become a snow-covered wasteland. Jack and Patrick lived in houses which are across from one another, but they do not speak. The baby has grown up to be Lu (Quinn McColgan), a precocious and curious child who lives with Jack. Jack and Lu mainly stay inside of their house, where Jack attempts to create as “normal” an environment as possible, while Patrick, who is often drunk, occasionally ventures out for supplies. This odd stasis is interrupted with Patrick learns that the violent people from before are still around and that they’ve evolved. Extinction plays out as a roller-coaster ride of promises and disappointments. The opening scene is rife with zombie movie cliches, right down to the “Everything’s OK...oh no, someone did get bitten.” Some of you will be tempted to turn to the movie off at this point. Then, the jump ahead in time occurs and suddenly we are faced with some questions. Why has the world become a tundra? What are the relationships of these three characters? And most importantly, why don’t Jack and Patrick talk anymore? Unfortunately, we only get an answer to one of those questions. (I won’t tell you which one.) However, these questions do move the movie forward and make it interesting for a brief period. However, we know that this is a horror movie and that the focus will shift away from the human factor at some point, and when it does, Extinction dives right back into cliches. One can argue that the second half of the movie is a monster film as opposed to a zombie film, but the same hackneyed story points arrive all the same. The finale, which becomes a full-on siege movie, contains some interesting shots, but they doesn’t change the fact that we’ve seen it all before. It’s interesting that Extinction rolls out many zombie movie platitudes, but the bulk of the film -- the idea that zombies can’t live in the cold -- is an idea taken from the novel World War Z, which did not appear in the movie. (If you really want to go down that rabbit hole, you’ll remember that Matthew Fox has a brief appearance in World War Z, but his role was cut down significantly when the third act was re-structured.) If Extinction could have avoided these old ideas, it had the potential to be an intriguing movie. Again, the notion that two old friends live right beside each other, but don’t talk is a great jumping-off point for a movie, but the film only scratches the surface of being a drama about relationships and falls back into being a horror movie. 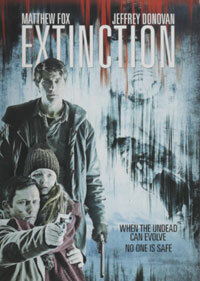 Despite the presence of two leading-men from TV, Extinction has very little personality and will only be compelling to zombie movie completists. Extinction features some incredibly bad CGI on DVD courtesy of Sony Pictures Home Entertainment. The film has been letterboxed at 2.35:1 and the transfer has been enhanced for 16 x 9 TVs. The image is sharp and clear, showing no overt grain and no defects from the source materials. Given that a good deal of the film takes place against snowy white backgrounds, the lack of grain is impressive. This is a dark, monotone film, but the occasional splashes of color look good and the image is never overly dark or bright. For a DVD, the level of detail is good, as is the depth. The DVD carries a Dolby Digital 5.1 audio track which provides clear dialogue and sound effects. While we are treated to solid stereo and surround effects throughout, the track really comes to life during the finale, when we get distinct sounds coming from the front and rear channels, which really highlights where action is taking place. The subwoofer effects are strong as well. The Extinction DVD contains several extra features. "Making of Extinction" (13 minutes) features interviews with the cast and the creative team. Those who worked behind the camera speak Spanish (with English subtitles). The piece touches on the story and themes, and then goes into the production, playing special attention to the challenges of spreading snow on a set. (Note that the movie goes under its original title "Welcome to Harmony" here.) "The Apocalypse" (3 minutes) is an odd little featurette which sort of has to do with the geography of the sets. "The Creatures" (3 minutes) focuses on the film's monsters, including their look and movements. "Digital Effects Part 1" (3 minutes) and "Digital Effects Part 2" (2 minutes) feature comments from Visual Effects Supervisor Juan Manuel Nogales who talks about the visual effects while we see breakdowns of how certain shots were layered. "Matthew Fox and Jeffrey Donovan" (2 minutes) has the two actors describing their characters, while "Clara Lago and Quinn McColgan" (2 minutes) allows the female cast members to do the same thing. "VFX Breakdowns" (3 minutes) simply brings back things we saw in the earlier visual effects piece.